Stuck what to do with your goat this Summer? Then be stuck no further, Blackpool Britain’s oldest seaside resort has decided to become goat friendly in a bid to pull in the ‘goatastic’ crowds. So from today all attractions are goat friendly so come along and join in the fun, even celebrities are getting in on the act at the Madame Tussauds Waxworks. 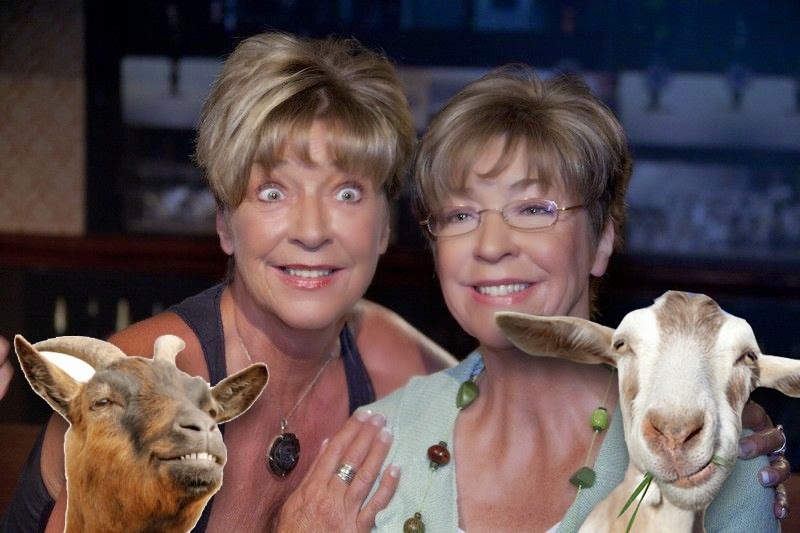 ‘Goats are great’ admitted Kevin Webster as he unveiled his waxworks this weekend, ‘I think we should let goats drive trams and stuff, they have already got horns!’ thanks Kevin, we’ll do the jokes if you don’t mind. 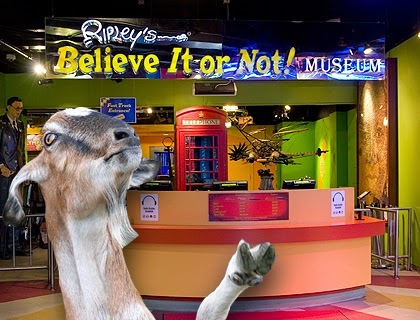 Gary had traveled all the way from Fleetwood to be the first goat through the newly refurbished Ripley’s Believe It Or Not’. ‘I don’t believe it!’ said Gary before leaping on to the counter and eating part of Big Ben made out of matches. 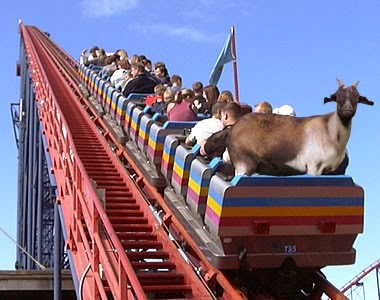 The pleasure beach have installed special seats at the back of all their rides that allow goats to free stand in complete safety. Here Colin tries out the Wild Mouse. Unfortunately Colin could not be found after the ride but witnesses report a series of bleats echoed passed the tower sometime around midday and strange mysterious brown marbles were found scattered across the seafront. Witnesses say they were most unusual and smelt bad but were baffled as to why they were not sausage shape like the ones in the sea. No visit to Blackpool would be com-bleat (see what we did there?) without a romantic trip in the tunnel of love. Here Bert and Mabel get ready to experience true love pumping action. 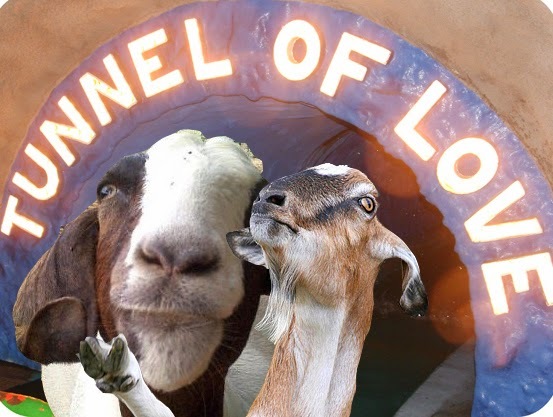 Unfortunately the tunnel of love now reflects 2014 Britain so Bert and Mabel came out the other end shocked and unable to describe the sordid scenes of debauchery they had just witnessed. Mabel had to be revived as she recalled the ‘Rampant’ section and feinted again at the word scrollock. 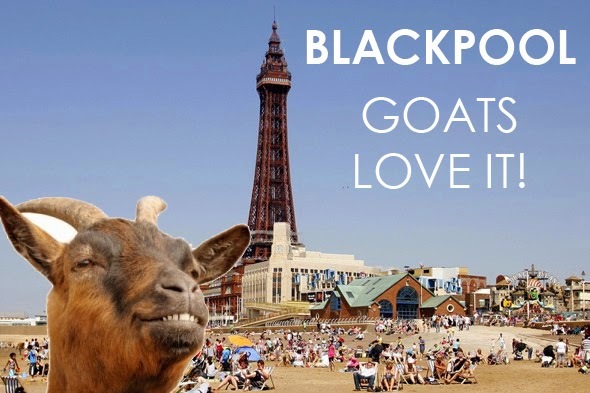 Goats are welcome to visit Blackpool all through the summer where they will be holding various events such as Goat Pride and Miss Gorgeous Goat 2015.